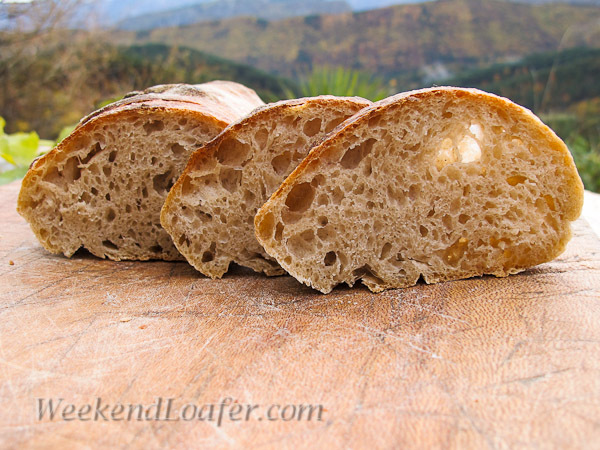 Gently scrape the dough out onto a lightly floured counter or, you can do this in your bowl. You can see this turning of wet dough by Susan at WildYeast or an artisan baker at Milawa Bakery. Cover the dough and let it rise for one more hour, and repeat with another fold. 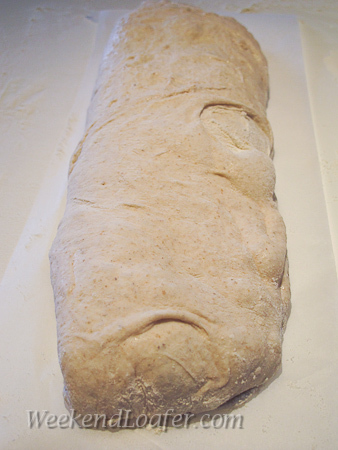 Allow the dough to expand for one or two hours more till it is twice the original size. Turned out of bowl...Look at that bubble! 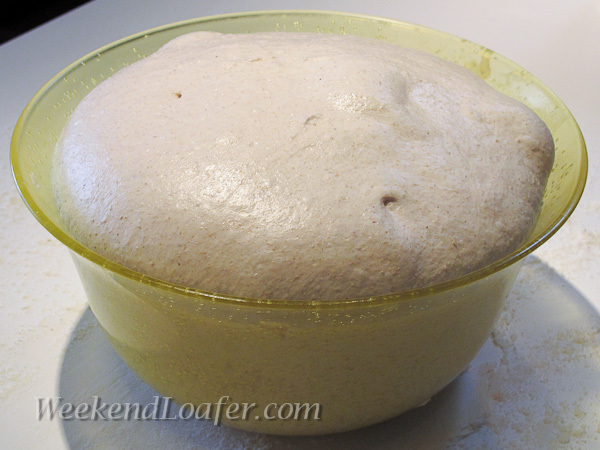 Place the covered dough in the refrigerator and allow the dough to ferment slowly for 12 to 24 hours. Before baking, remove from refrigerator and let it sit on counter for two to three hours before dividing. 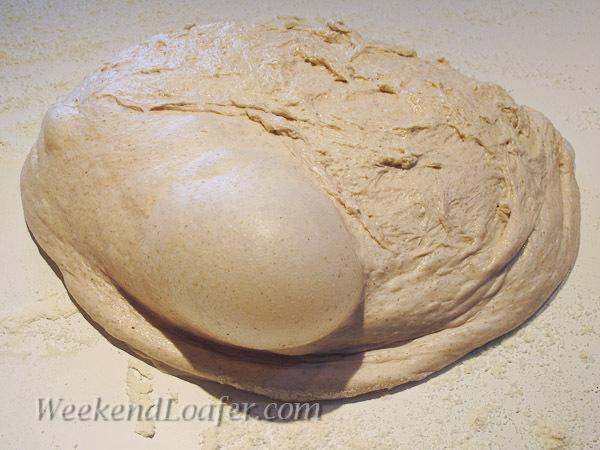 Gently scrape the dough out onto a generously floured counter, trying not to fold the dough on itself to preserve structure of the dough. 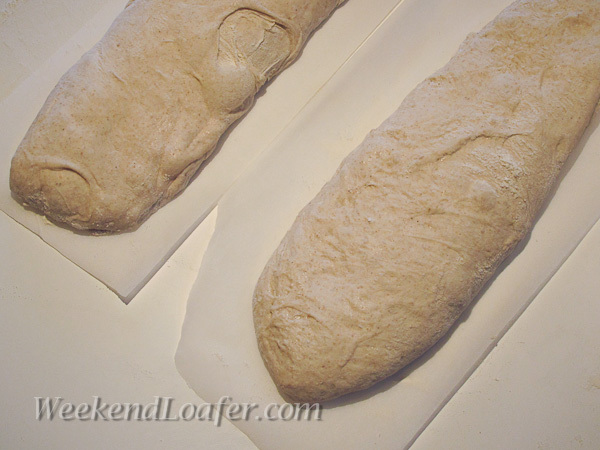 With floured hands, gently stretch/form the dough into an approximately a 10 inch square. With a floured bench scraper, cut the dough into two equal pieces. 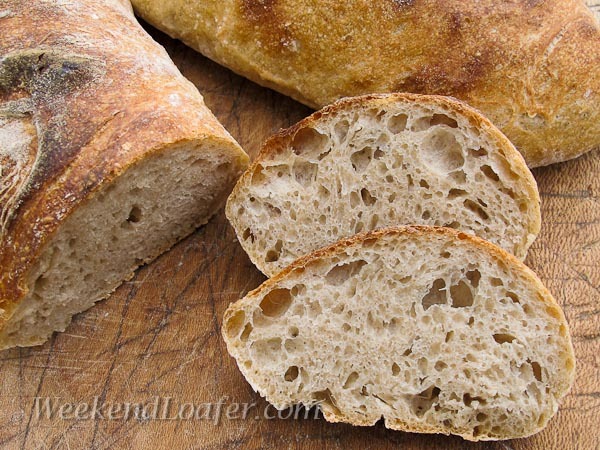 With floured hands swiftly lift the dough from both ends onto a piece of floured parchment paper. 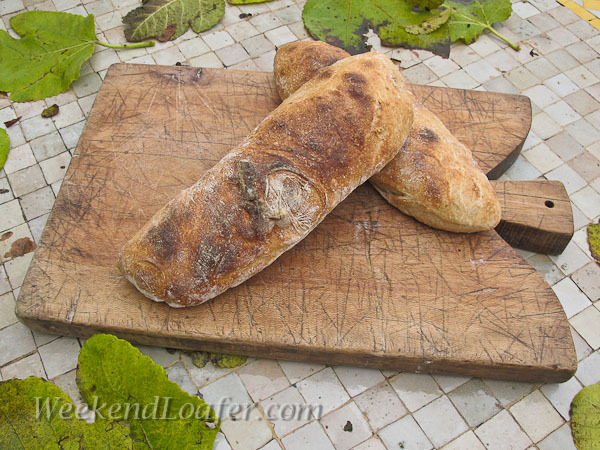 The rustic loaf should be approximately 12 inches long. Repeat with the other piece of dough. Slide the shaped dough (on the parchment paper ) onto the baking stone, add more ¼ cup of water for steam if necessary and turn down the oven to 450°, continue to bake for 20 to 30 minutes. Bake the loaves until they are an even golden brown. 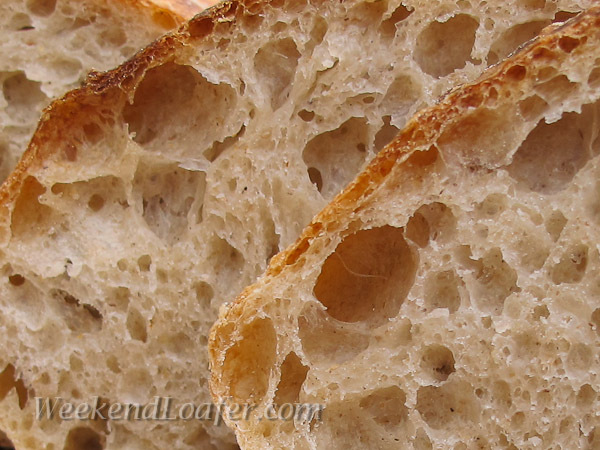 Remove loaf from oven with parchment paper. Let cool for at least one hour on a wire rack before digging in. I like to cover the cut end with a piece of plastic wrap secured with a rubber band and wrapped in a kitchen towel ,a piece of linen or place in a paper bag.